Black Friday deal: Save big on Samsung soundbars, get free Deezer | What Hi-Fi? The day itself may be over, but the Black Friday sales are continuing into Cyber Monday. Currys is offering discounts on several Samsung soundbars and chucking in 9 months of free Deezer Premium (usually £9.99/month) and 6 months of free popcorn (yes, really) with each purchase. The soundbars in the Cyber Monday sale include the Samsung HW-MS750, which we awarded four stars to at its then-£700 price tag for its music streaming smarts and large, spacious and balanced sound. It’s now only £500, down from its £799 price earlier this month. With optical, HDMI and USB connectivity, Bluetooth, music service streaming via wi-fi, hi-res audio support and a 450-watt output, this is certainly one kitted-out sounder. Smaller room perhaps? If you’re happy to sacrifice some speaker drivers and channel processing, you can spend less and get the Samsung HW-MS650, which is also also on sale for a budget price of £299. You get nine speakers instead of eleven, and audio processing up to 3 channels rather than 5.1. The most modest of the three is the Samsung HW-MS550, which again offers less in the way of audio design, with six speakers and 2.1 channels - but for just £249. 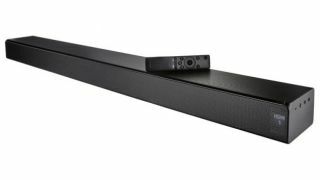 We can’t wholly vouch for the HW-MS650 or HW-MS550 as we can their tried-and-tested pricier sibling, though, so if you’re after a budget soundbar that’s a proven performer, there are plenty of Cyber Monday soundbar deals to be had this Black Friday weekend - including on the ‘Product of the Year’ Sonos Beam.